Devil May Cry demo TODAY! Thats right PS3 fans, from today you can get your grubby little hands on the brand new Devil May Cry demo from Sony, although the catch is that you either have to be an American or have a US PSN account. This is because the European release date for the demo is set to be on January 31st. Not a major set back but still a major blow for any European devil fans. Capcom had these words to say about the demo: “The demo introduces gamers to the gothic-inspired supernatural world of Devil May Cry 4, new protagonist Nero and the awesome power of his Devil Bringer. 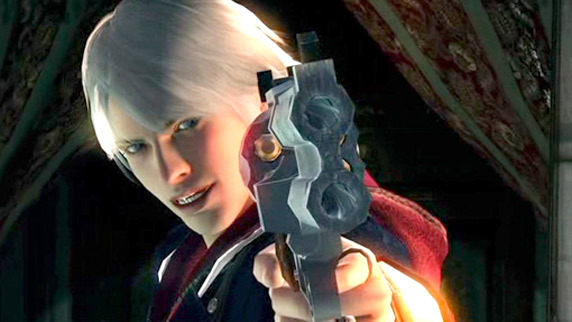 The demo consists of a sampling of sections from the full game, chosen to showcase Devil May Cry 4’s varied locales and allows gamers to familiarize themselves with Nero’s unique abilities. “Players will receive instruction on the various new actions that the Devil Bringer bestows, such as the ability to slam creatures to the ground, cover great distances in a single bound or even grab enemies while on the ground or in the air and pull them towards Nero to continue the attack combo. So what are you still reading this for, go get that download now, and to wet your appetitie here are a few screens from the game itself which should be with us this February, enjoy. Next story GTA IV release date announced!! !